This entry was posted in Humour, Newspapers, Pictorial, SLWA collections, State Library of Western Australia, WA history, Western Australia and tagged coolgardie, romance, WA history by karendsm. Bookmark the permalink. In searching family history of my husbands grandfather, I discovered this article. His Grandfather and Grandmother were married in Coolgardie on 17 November 1896. They were Rowland Hill Macdonald and Marguerite Jones. Rowland Hill owned the Exchange Club Hotel, listed in th Londonderry Postal Directory of 1899. Marguerite’s father was George Jones a miner who was also shown as a Pioneer of 1896.They lived in Piesse Street, Coolgardie. Thanks for sharing your story with us. How fascinating! It’s wonderful you’ve been able to discover this information about your family history. My great grandmother Mary Davey arrived in Coolgardie with her sister Emily Mathews (nee Bartholomew) in 1894. 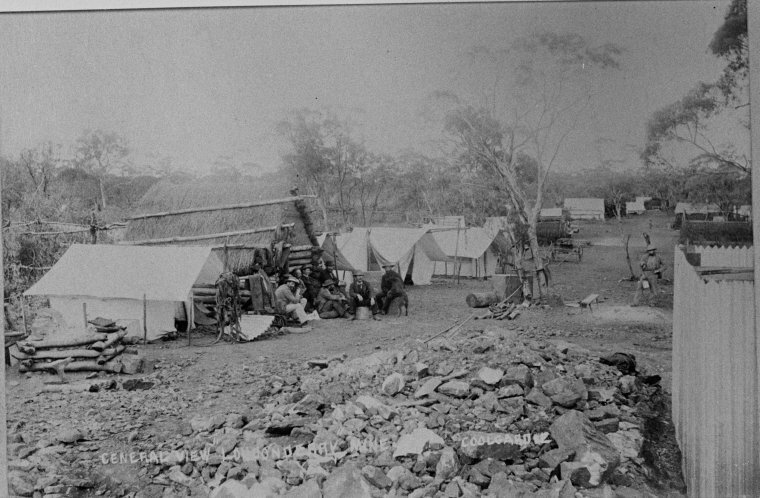 Emily had owned a hotel with her husband John Mathews in Wilcannia. On his death she headed back to her family home in South Australia and picked up her 22 year old little sister (Emily was 38 years old at the time). They travelled to Coolgardie where they opened the Miners Arms Hotel on the corner of Bayley and Ford St. It burned during the great fire but around that time Emily managed to snag one of the towns more eligible bachelors. He was Frederick Brewer, 13 years Emily’s junior. Fred was not only an accomplished builder but also owned a condensing plant (his brother Charles had the Bonnievale Hotel). They rebuilt the Miners Arms as the Metropolitan Hotel and made a great deal of money. After travel overseas they settled at Mounts Bay Rd Crawley until Freds premature death in 1912. The house there was a limestone bungalow with a large garden and included the boatshed that is still there today. Unfortunately family photographs of the house and boatshed were destroyed in the 1990s. My great grandmother Mary went to Kalgoorlie and operated the Railway Hotel in Burt St Boulder with her husband Charles Davey. After his death she moved to Perth to be near her sister.